The ASRock X299 Extreme4 has a pretty straightforward look to it with a matte black motherboard using black connectors - all of the eight DRAM slots, SATA ports, and PCIe (though the latter has reinforcement on it) are black. The board has a few strips of grey lines running across it for flair. The 11-phase VRM uses dual heatsinks, connected via heatpipe, to remove heat. The heatsinks have a lot of mass and a lot of surface area so they should be good performers. 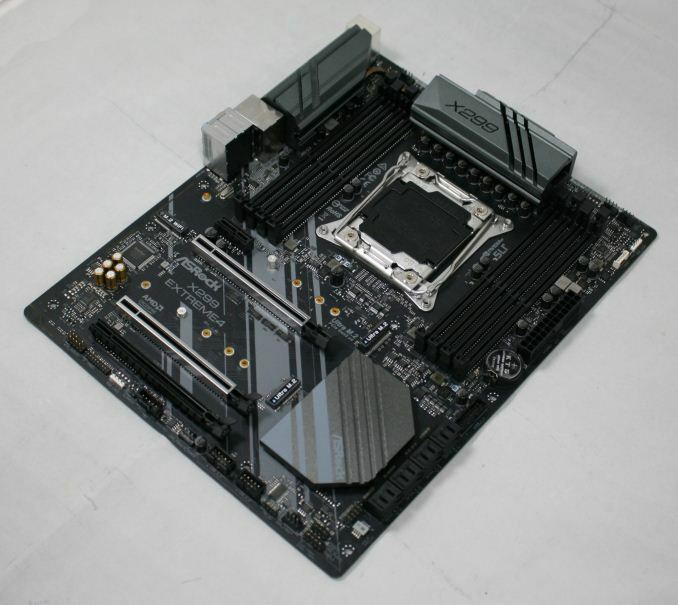 The chipset and VRM heatsinks are grey offering a bit of an accent color to an otherwise mostly black board. 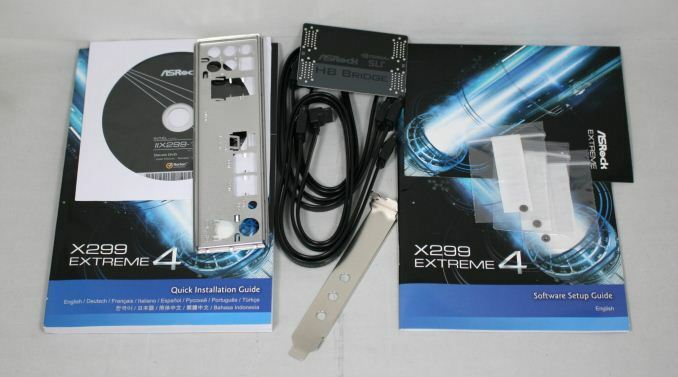 We do not find any fancy shrouds or lots of RGB LEDs on the Extreme4. It's a what you see is what you get type of aesthetic. The only RGB LEDs found on the board are hidden under the chipset heatsink and give the board a nice glow down in that area. 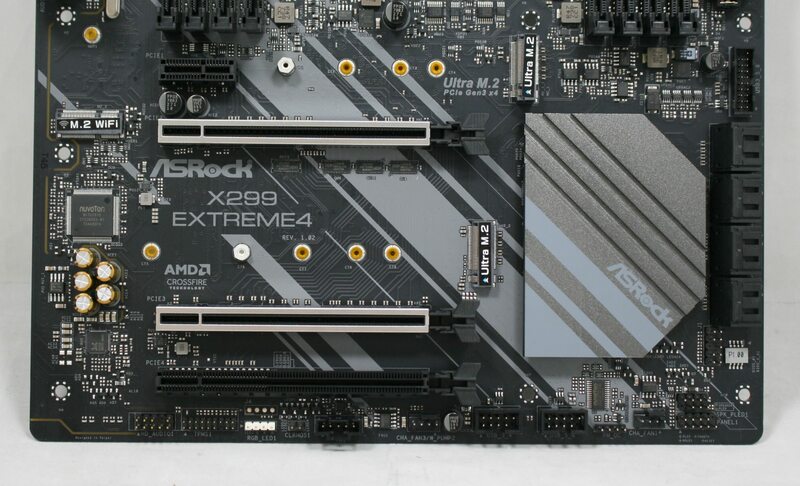 Outside of how it looks, we are able to see dual M.2 slots, eight SATA ports, and three full-length PCIe slots which should give users plenty of options for connectivity, especially at this price point. 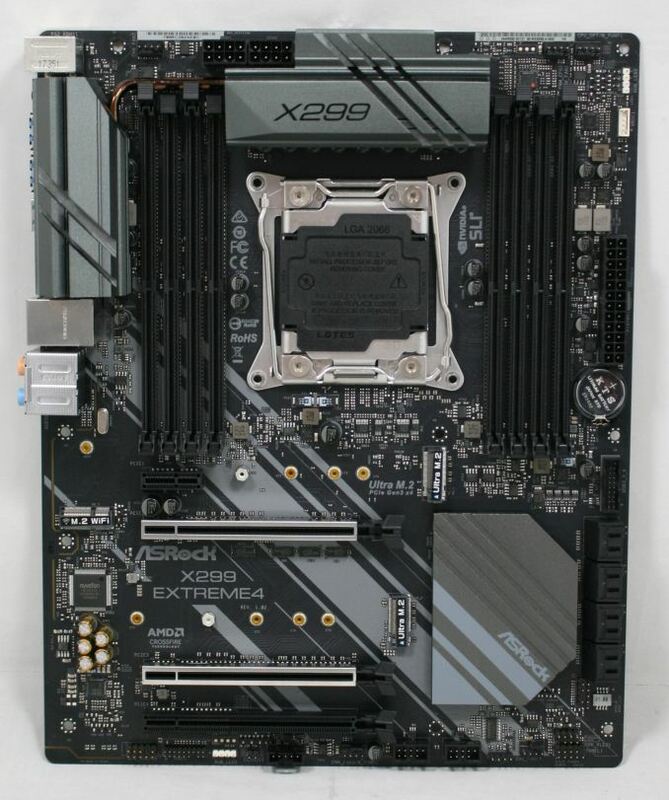 The X299 Extreme 4 has a total of five fan headers located on the board. Up top on the left is a 4-pin Chassis fan connector while towards the top right are 4-pin CPU fan connector and CPU Opt/Waterpump connector. The CPU fan can support a maximum of 1A (12W) while the CPU Opt/Water pump supports a maximum of 1.5A (18W) in order to support the higher power draw of pumps versus most fans. At the bottom of the board are two more 4-pin fan headers - the second chassis fan and a second header for a water pump. All headers except for the CPU fan connector use ASRock's Smart Fan Speed Control which allows the header to be controlled by either PWM or DC. I would have liked to see this across all headers on the board. ASRock implements an 11-phase VRM with premium memory alloy chokes, Nichicon 12K Black Caps (12K hour lifespan), as well as dual-stack MOSFETs. The MOSFET used is the Fairchild (bought by On Semiconductor) FDPC5030SG which are capable of 35A at 100°C and 56A at 25°C. These MOSFETs are controlled by an Intersil controller. 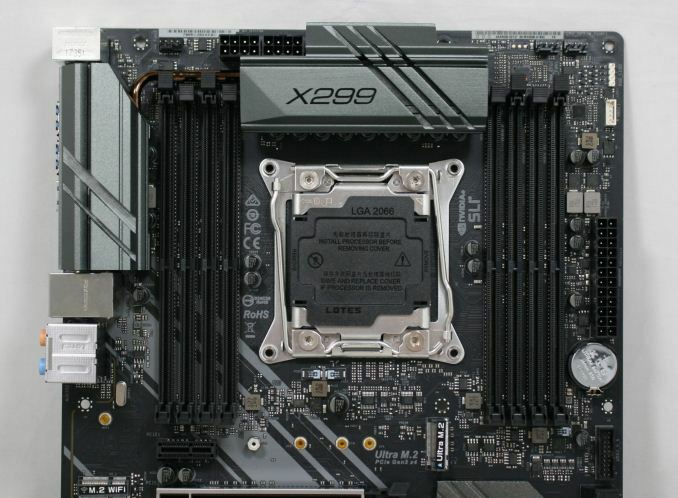 These are a bit different than the parts used on the more formidable VRM of the ASRock X299 Taichi we reviewed. While these will still be able to handle most ambient overclocks, keeping them cool is key to their efficient operation. This should be not much of an issue due to the large dual heatsinks. Power is delivered to the VRM via two 8-pin EPS power connectors - one is mandatory, the other optional. The top half of the board doesn't have too much going on. 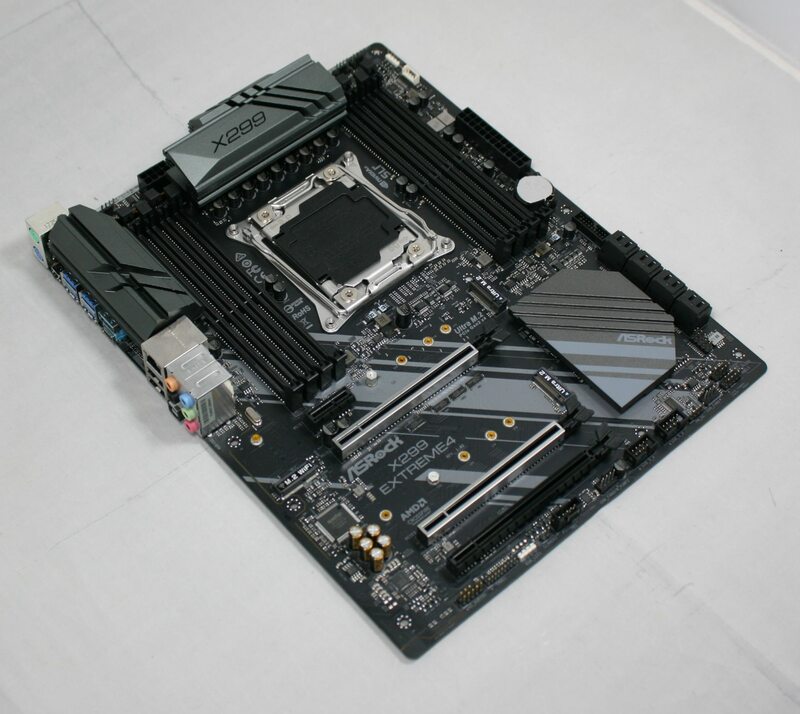 We see a closer shot of the VRM heatsinks, the fan headers and EPS connectors up top. The eight DRAM slots are not reinforced and use a one latch system for locking the sticks in place on the board. Memory compatibility is rated to DDR4-4200 for both Skylake-X (quad-channel) and Kaby Lake-X (dual channel) RAM with capacity up to 128GB. Not present on the board is a debug LED or any dummy lights (ASRock calls these Q-LEDs on their other boards) showing where the board is caught on boot. This can make troubleshooting more difficult but is just one of those options that had to go for it to stay at its entry-level price point. 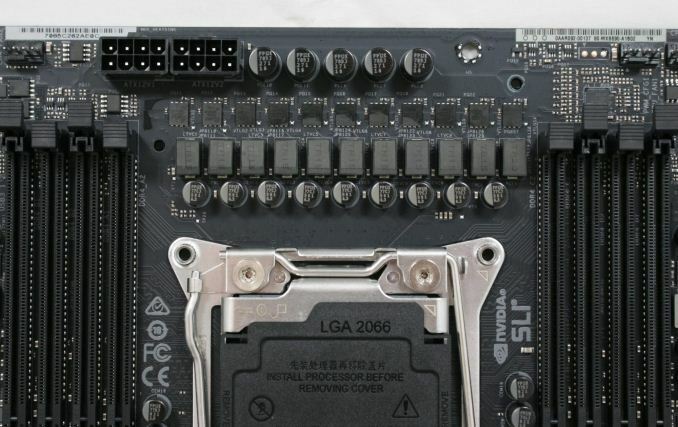 Focusing in on the right side of the board: on the bottom we see the full complement of eight SATA ports and next to it is a front USB 3.0 header, the battery, and the ATX 12V connector. In the top corner are two fan headers, an RGB LED header, as well as the Intel VROC header. All eight possible SATA connectors sit together on the bottom right corner of the board and support RAID 0, 1, 5, and 10. The SATA ports do share bandwidth with the M.2 slots. For example, if the first M.2 slot is occupied with a SATA based module, then SATA port 0 is disabled. If the second M.2 slot (between the PCIe slots) is occupied with a SATA based module, SATA port 1 is disabled. If the modules are PCIe based then the SATA ports are unaffected. As far as storage options, we mentioned earlier there are two M.2 slots, both capable of supporting SATA or PCIe based M.2 modules, while a third M.2 slot, key-E, is dedicated for a Wi-Fi module (not included). The two M.2 slots for storage can hold up to 2280 sized drives. About the only thing missing is U.2 connectivity, but outside of it being used much less than M.2 or SATA for the home, the majority of OEMs do not add this until much higher priced boards. The bottom of the board has a range of headers across its width. From left to right there is the HD Audio, TPM, a second RGB LED header, a clear CMOS jumper, a Thunderbolt 3 header for an add-in card, chassis fan headers, USB 2.0 headers, as well as front panel headers. There are no power/reset buttons. The bottom half of the board shows off a few things here. We first notice the audio section and the Realtek audio codec. ASRock and its Purity Sound 4 combine hardware and software in an aim to deliver quality audio to the user. The gold audio connector header, individual PCB layers for left and right channels, a Texas Instruments NE5532 headset amplifier and the Nichicon Fine Gold Series Audio Caps make up the audio implementation. Just above that is room for a M.2 Wi-Fi module. Typically we find these mixed in with the back panel, but since the oversized heatsink is there, it had to go elsewhere. The board comes with a total of four PCIe slots. The top slot is x1 and is connected via the chipset, while the three full-length slots are fed from the CPU. The main GPU slots do use ASRock's steel reinforcement for more peace of mind when using heavy video cards. The board supports both SLI and Crossfire as well as Quad SLI and Crossfire when dual-GPU cards are used. Three-way is not supported. If the top PCIe x1 slot is occupied, the third M.2 slot for Wi-Fi will be disabled. The final x4 comes from the chipset. Below is a quick reference table to show how the PCIe lanes are split out for various configurations. The "@" symbol is used to show slot preference for the configuration. The accessory stack has enough to get you started, but not much else. I resigned my office-job and now I am getting paid 85 D0llar hourly. How? I work over internet! My old work was making me miserable, so I was forced to try something different, two years after...I can say my life is changed-completely for the better! lots of **** that will buy this broken platform. There have been four X370 boards reviewed, and two B350. Borrowed this list from the ASROCK ITX X370 review on the front page.